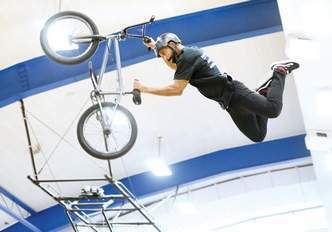 DELAVAN–Delavan-Darien High School students piled noisily into the gymnasium Friday to watch members of the ASA Action Sports Tour attempt daring stunts and to deliver a message. ASA is partnered with the Anti-Defamation League to promote an end to bullying in schools. 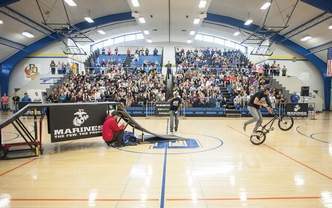 Delavan-Darien High School was one of five schools in Wisconsin chosen to host the event paid for by the Marine Corps, one of the event sponsors. The event was coordinated by Assistant Principal Amanda Urmanski. The response has been positive at every school the team has visited, said Tyler Henk, ASA tour manager and organizer. “Sometimes you don’t think they’re listening, then they start saying facts and statistics about bullying after the show,” Henk said. Henk started ASA as a competition in 2000 but soon transformed into a campaign against tobacco use in schools. The message shifted in about 2009 after tobacco use in schools fell. The team is composed of 20 athletes, but Friday’s event had only four. Rider Mykel Larrin of Racine said he experienced bullying in his past. “When I heard it was anti-bullying, it kind of touched home,” Larrin said. Sammy Veal of Houston, Texas, was emcee for the event Friday. Veal also runs a youth program in Houston called Real 101 that discusses bullying. 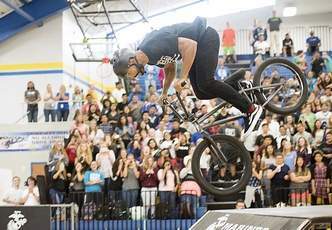 While the riders did tricks and stunts, Veal talked about statistics of bullying, methods of fighting bullying and cyberbullying. After the event, Veal asked the crowd questions about what he’d said. Correct answers earned ASA merchandise. Veal reminded them that standing up to bullying is a choice. Jackie Damrow, a senior, said she felt the event had boosted morale, and the group had a positive impact on the school. Hunter Huber, another senior, said that it was a fun way to get the message across.